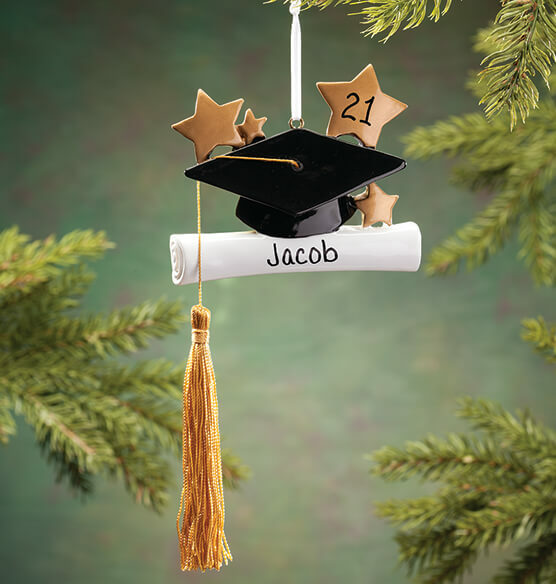 This personalized graduation ornament is an ornament that new grads (and their loved ones) will appreciate for a lifetime. 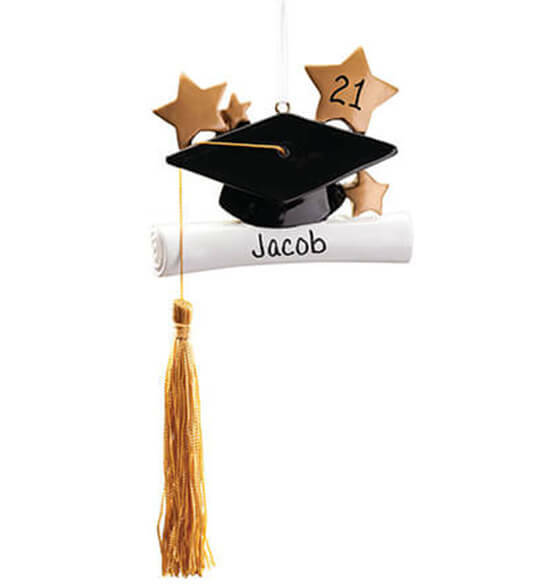 This graduation Christmas ornament is diploma topped by a traditional cap with stars. Resin. 2 3/4" wide x 2 1/2" high. Specify name; limit 1 line, 12 letters or spaces. Specify year; limit 2 characters. We’ll handpaint the name on the diploma and the year on the star. I bought four of these for friends that will be graduating in 2016. I loved them & so did the friends. This item would be good for any student. My granddaughter loved it. I, also, loved it. I gave it 5 stars because it was worth it. Our granddaughter will like this personalized ornament. This will hang on the Christmas tree every year as a reminder of the degree that was earned. I would definitely recommend this ornament!! Nice ornament, it makes a beautiful keepsake!! I have been buying your specialized ornaments for years because it's easy to shop and I know I'm getting the best. Great Christmas gift for a graduate! A great Christmas gift for a grandson who will graduate in the spring. I got this for my Grandson he graduated from high school this year. Great gift. A wonderful gift for a recent graduate. Good quality & I am happy that it is a personalized gift. Our grand-daughter Taylor is a senior this year. When we gave her the personalized graduation ornament she was touched by the meaning of the cap, book, and graduation year of 2012. This is an ornament she will cherish for a lifetime. Although I won't give this Christmas ornament until Christmas 2019, I am very pleased with my purchase. I wanted to give this to my sister who attended her 50th class reunion. I bought a white pen and added her graduation year on the black hat to show the 50 years from the current year. Looked perfect and she was thrilled! This is Christmas gift for our granddaughter. I will buy more from Miles Kimball! Gave these at Christmas for two upcoming graduates. Bright and beautiful. For christmas tree used, the hand writing not professional, looks like a middle school kid hand wrote, name not in middle and the line is so slim and tiny, I need to re-write it over again. Apparently it was lost in the mail. And then was out-of-stock!! It was the nicest one I found. I liked the size and the personalization. My daughter is a senior! !